Just as they were hitting the big time, shortly after the release of the "Sweet Dreams" single, this is an interesting listen to a band who, of course, went pretty global not long after. This was originally an FM recording and so is an excerpt of the full gig. 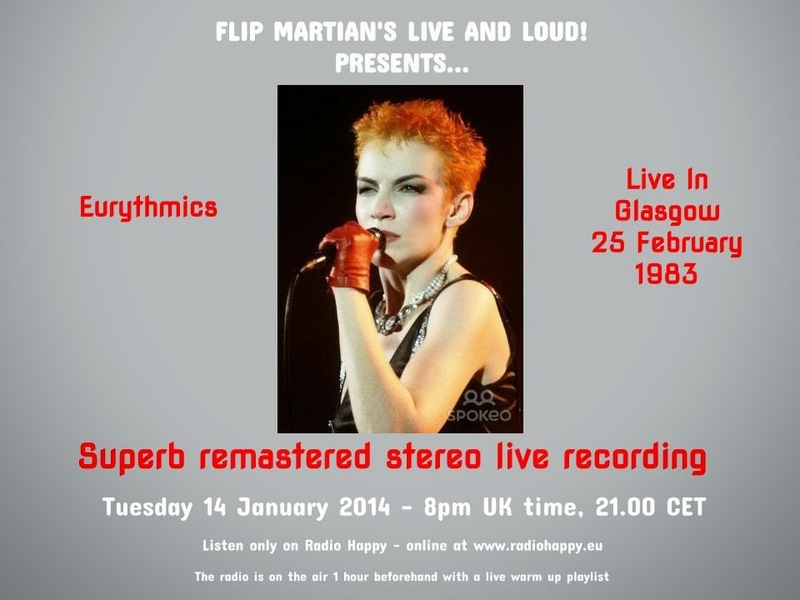 Once again its been remastered - the original recording I had was actually at the wrong speed, which made Annie Lennox sound a bit like she was on helium! So a bit more work on this one but I hope you enjoy it! While preparing this old show as separate files for a donator to the site, I found I could now improve the sound quality further, over what I’d originally done to the recording several years ago. You can now download this new version (as of 2019) HERE as 1 new 320kbps MP3 file. Incidentally, the setlist has been corrected a bit from what was included with the original bootleg. The radio show setlist as written differed a bit from the complete setlist as noted on Setlist.fm - hopefully correct now but I've left the full setlist here for info. Brilliant, thanks for that. Much appreciated.